The Central Coast surf clubs Rookie Lifesavers showcased their skills at Terrigal Beach on 12th January competing in the Resinc Solar Rookie Lifesaver Challenge. All events conducted were team orientated and designed around lifesaving scenarios that the rookies could be expected to face whilst on surf patrol. Rookies also participated in theory tests, resuscitation and on their flag signals used on patrolling duties. 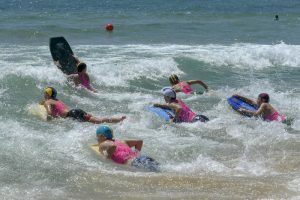 The event is designed to test young U14 Rookie Lifesavers in vital lifesaving techniques, knowledge and skills against their peers from other surf clubs whilst also rewarding the young lifesavers for their commitments towards their surf clubs. Umina Beach proved their grass root lifesaving program is going strong finishing in the top three in six out of the seven events contested. 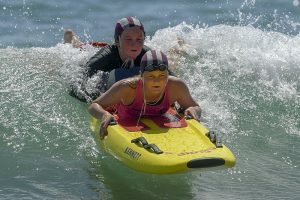 In doing so they claimed the overall point score trophy ahead of Terrigal and Avoca Beach surf clubs who finished second and third respectively. The Resinc Solar Rookie Lifesaver Challenge is one of the most enjoyable events of the season but also a very important event as it helps local surf clubs develop and retain their young lifesavers as well as build team spirit that is so important for surf life saving patrols. Rookies are currently patrolling our beaches and, over the years, they have been involved in many large rescues and the saving of lives. The skills on display were exceptional and it was great to see all involved having so much fun. The Rookie Challenge is a great event for Central Coast young Rookies and will go a long way to ensuring the future of the organisation and retention of junior members. Thank you to Resinc Solar for their incredible support with the Rookie Program this year! It was really great to welcome you to the Rookie Challenge this year and thank you for hosting the BBQ.